The original i10 is now listed on QVC, the shopping channel, while supplies last. Sleep Number makes beds designed especially for QVC, but the channel also serves as a market avenue for discontinued products. The i10 Legacy is a 15” high adjustable air bed. When it was first introduced, it was the top-of-the-line model of Sleep Number beds. Like all Sleep Number beds, it has an air support core. Since only Queen, King, California King, FlexTop King and Split King sizes are available, all i10 Legacy beds have DualAir Adjustability, which means a separate air chamber for each of two sleepers. Each side has its own Sleep Number. This means that each sleeper can select his or her own level of support (the air pressure in the chamber – the higher the pressure, the firmer the mattress). Atop the air chambers are the comfort layers. It is these which qualify the i10 Legacy as a plush mattress. Besides padding directly on the air chambers, the i10 Legacy has a duvet style pillowtop. This means that it can be taken off, but not to set aside. It is a two-sided duvet, with 2” of Plushfit polyurethane foam on one side and 2” of memory foam on the other, so the user chooses which side is on top. 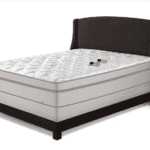 On a split King, this means one sleeper can have the memory foam on top, and the other can have the Plushfit. In 2017, it was one of three Sleep Number beds with memory foam. The ticking of the i10 Legacy is spun rayon, which is quilted with 2” of Hypersoft Foam. A common complaint about the single air chamber per side is hammocking – sagging in the middle at softer air levels. What happens is that as the air pressure is lowered, the heavier mid-section of the body pushes the air to the ends, raising the head and feet. This is more pronounced for heavier persons. Lighter persons can have a lower comfortable Sleep Number than heavy sleepers, who have to have a firmer air support if they wish to avoid hammocking. 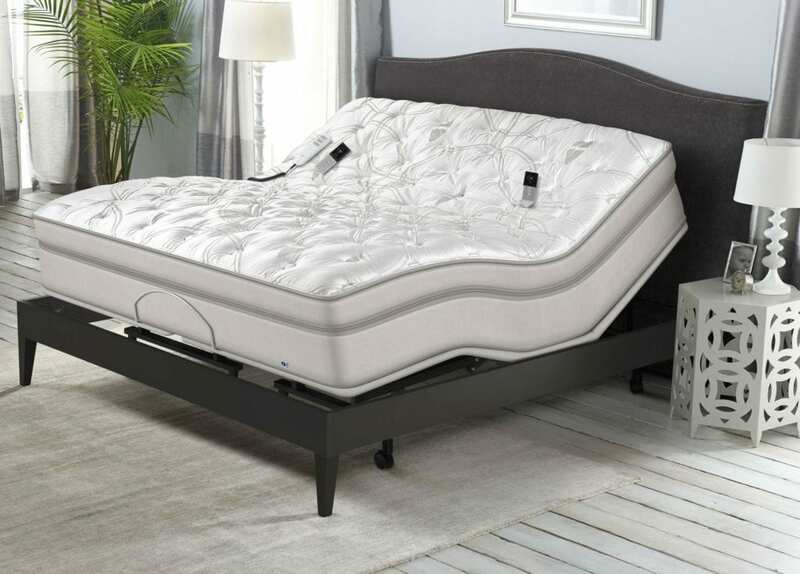 By contrast, adjustable air bed brands, such as Air-Pedic, which have three chambers on each side – head, mid-section, and feet – which maintains support for the hips and lumbar while cushioning the head and feet. This is more critical for side sleepers than for back sleepers. The air chambers extend the full length of the bed and are separated by a partition in the middle of the bed. This has been a problem for several couples, especially with not-as-firm settings. The separation interfered with cuddling and intimacy. Some commentators have derided the use of memory foam on air beds. They say that the memory foam competes with the air for conforming support. We can see how this may be true at softer setting for the air, especially in single air-chamber (per side) models, such as Sleep Number beds, and not as significant a concern for those with separate lumbar air support, such as Air-Pedic. At firmer (higher Sleep Number) settings, the memory foam should perform as designed. The i10 Legacy boasts “temperature balancing” from Outlast material used on the dual-sided duvet. This is one of the many moisture-wicking technologies which have become common in mattresses and pillows. In most cases, it has been the memory foam which necessitated temperature control, since memory foam tends to absorb and accumulate the sleeper’s body heat. This is one reason a sleeper may want a foam other than memory foam on top. With or without various temperature-regulating materials – such as Outlast, Tencel, gel, and phase-change materials – cooling mattresses is more effective with airflow. The greater the flow of air, the better the cooling. For example, TempFlow and Snuggle-Pedic mattresses use the Airflow Transfer System developed by Selectabed. To their credit, Sleep Number does use convoluted foam in some models, which allows horizontal airflow, but the effectiveness of this depends on vertical airflow through the layers above. However, convoluted foam does have some durability concerns. Customer ratings for the original i10 (now Legacy or Traditional) are no longer found on Sleep Number, but it has been reviewed on GoodBed, Yelp, and Viewpoints. Of the ten ratings of the Sleep Number i10 on Yelp, two were for mattresses which had not been delivered, leaving eight reviews for consideration. Of these, four were 5 stars, one each had 4 stars and 3 stars, and two were for 1 star. The average rating is 3.63 (72.5%). This review site rated the Sleep Number i10 with 77% overall owner rating. This was not a raw number averaging of the customer ratings, but it figured in the ratings of support, pressure relief, etc. and other factors from the reviewers such as length of ownership and the stated conditions of their beds. On Viewpoints, seven customers rated their Sleep Number i10 adjustable airbeds with an average rating of 4.29 (85.715). There were 18 reviews of the i10 Legacy by customers on QVC/HSN. The average rating was 3.06 (61.11%). The top pro was dual air control. This was followed by the plushness of the comfort layers, even with firm support. The major con was hammocking (sagging in the middle). Another complaint was the difficulty for some in assembling the bed.